The last four weeks I've been featuring the paintings I did for Walter Foster Publishing for the book "The Art Of Painting in Acrylic". This is a step-by-step, learn how to paint book. The Editor of Walter Foster publishing emailed me and asked if I was interested in co-authoring a book on how to paint in acrylics and was asked to submit photos of possible scenes. I gave her about 10 for her team to review for the book. 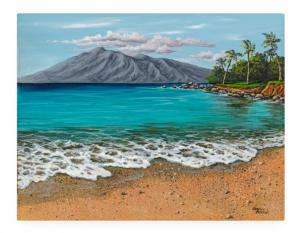 "Sandy Beach" is the last one of the four to be featured. But for this week, I've also included the other three paintings. Sandy Beach ( not the real name of this beach ) is a little beach just a few blocks from where we live. It's not a popular beach and it's really not much of a beach at all. It's located in Kapalua right off the lower road. The beach is sometimes referred to as "the beach at the S turns.There is only enough room for three cars to park on the side of the road. Luckily for us we can walk to it from our home. Creating this painting for the Walter Foster book was very exciting and challenging. The main focus of this lesson is creating sand and foam. For more on how I painted it you can buy the book. "The Art of Painting in Acrylic" is Ideal for beginning and intermediate artists seeking to develop or polish their acrylic painting skills, The Art of Painting in Acrylic features a range of techniques and valuable instruction for working with this classic medium. This comprehensive guide offers a fresh, modern approach to painting in acrylic. Beginning with detailed information for using acrylic tools and materials, The Art of Painting in Acrylic introduces artists to the basics, including paints and brushes, supports, mediums, and other essential information for working with this fast-drying paint. In addition to learning about basic color theory, painting techniques, and how to work with acrylic paint and textures, aspiring artists will enjoy putting their painting skills to use by practicing the step-by-step demonstrations designed to instruct and entertain. Professional acrylic painters provide easy-to-follow, comprehensive instruction and inspiration, enabling readers to learn techniques for mastering this lightweight, versatile, and easy-to-use medium. In-depth lessons cover a variety of subject matter ranging from still life and portraits to landscapes and animals. Along the way, aspiring artists will discover helpful tips and tricks for rendering a variety of textures, setting up compelling compositions, achieving accurate proportions, and more. With its breadth of content and detail, The Art of Painting in Acrylic is a must-have resource for any artist's reference library. Includes: Color Theory, Basic Drawing, Painting Techniques, Still Life & Flowers, Landscapes, Seascapes, Portraits, and Animals/Pet Portraits." About this painting; This is an 11x14 acrylic painting on canvas. I go into great detail of the process of painting this scene. If you want to learn how to paint it or just want to see the process and learn some tips you can buy a signed copy through me or at many art supply stores or online at Walter Foster www.walterfoster.com Amazon - www.amazon.com Barnes and Noble - www.barnesandnoble.com IndieBound - www.indiebound.org Indigo - www.chapters.indigo.ca . This week's featured 11x14 acrylic painting, "Sandy Beach" is available as well as prints in many sizes and a few products, such as tote bags, throw pillows and note cards. One of these will surely work well for your decorating needs. "Ho'okipa" is one of my four paintings featured in the book "The Art Of Painting in Acrylic" published by Walter Foster Publishing. This is a step-by-step, learn how to paint book. The Editor of Walter Foster publishing emailed me and asked if I was interested in co-authoring a book on how to paint in acrylics and was asked to submit photos of possible scenes. I gave her about 10 for her team to review for the book. Ho'okipa is Maui's popular surfing beach. Plenty of skilled suffers to watch and see some sea turtles resting on the beach. You might even get lucky to see an endangered monk seal taking a nap. We went there to photograph subject mater for paintings and was treated to a stunningly beautiful sunset. I was told later by locals that the colors were created by the vog. Vog is volcano pollution caused by the active volcano on the Big Island of Hawaii. Most of the surfers had exited the water as the sun went down and the beach was pretty empty. Creating this painting for the Walter Foster book was very exciting and challenging. I used a limited palette to help keep the color drama exciting.To create this painting I started with an underpainting of cad red light. For more on how I painted it you can buy the book. "Olowalu Valley" is one of my four paintings featured in the book "The Art Of Painting in Acrylic" published by Walter Foster Publishing. This is a step-by-step, learn how to paint book. The Editor of Walter Foster publishing emailed me and asked if I was interested in co-authoring a book on how to paint in acrylics and was asked to submit photos of possible scenes. I gave her about 10 for her team to review for the book. Olowalu has become my favorite place to visit on Maui. There is a jetty that extends out quite far. From the end of the jetty you can see Moloka'i, Lana'i, Haleakala, Kahoolawe and of course Olowalu Valley. At sunset time there is so much drama happening it's hard to focus on just one spot. I shot so many reference photos that I ran my iPhone's battery completely down. The scene you see here is the reflected color from the sunset that was happening behind me. To creat this painting I started with an underpainting of cad red light. For more on how I painted it you can buy the book. The Art of Painting in Acrylic is "Ideal for beginning and intermediate artists seeking to develop or polish their acrylic painting skills, The Art of Painting in Acrylic features a range of techniques and valuable instruction for working with this classic medium. This comprehensive guide offers a fresh, modern approach to painting in acrylic. Beginning with detailed information for using acrylic tools and materials, The Art of Painting in Acrylic introduces artists to the basics, including paints and brushes, supports, mediums, and other essential information for working with this fast-drying paint. In addition to learning about basic color theory, painting techniques, and how to work with acrylic paint and textures, aspiring artists will enjoy putting their painting skills to use by practicing the step-by-step demonstrations designed to instruct and entertain. Professional acrylic painters provide easy-to-follow, comprehensive instruction and inspiration, enabling readers to learn techniques for mastering this lightweight, versatile, and easy-to-use medium. In-depth lessons cover a variety of subject matter ranging from still lifes and portraits to landscapes and animals. Along the way, aspiring artists will discover helpful tips and tricks for rendering a variety of textures, setting up compelling compositions, achieving accurate proportions, and more. With its breadth of content and detail, The Art of Painting in Acrylic is a must-have resource for any artist's reference library. Includes: Color Theory, Basic Drawing, Painting Techniques, Still Lifes & Flowers, Landscapes, Seascapes, Portraits, and Animals/Pet Portraits." About this painting; This is an 11x14 acrylic painting on canvas. I go into great detail of the process of painting this scene. If you want to learn how to paint it or just want to see the process and learn some tips you can buy a signed copy through me or at many art supply stores or online at Walter Foster www.walterfoster.com Amazon - www.amazon.com Barnes and Noble - www.barnesandnoble.com IndieBound - www.indiebound.org Indigo - www.chapters.indigo.ca . 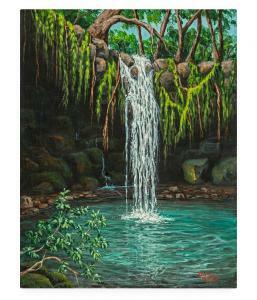 "Twin Falls" is one of four of my paintings featured in the book "The Art Of Painting in Acrylic" published by Walter Foster Publishing. This is a step-by-step, learn how to paint book. The Editor of Walter Foster publishing emailed me and asked if I was interested in co-authoring a book on how to paint in acrylics and was asked to submit photos of possible scenes. I gave her about 10 for her team to review for the book. Twin Falls was one that made the cut. Twin Falls is the first waterfall you come to on the road to Hana. It's a short beautiful hike through a tropical landscape. The pool under the falls offers a nice refreshing opportunity to cool off once you reach the falls. You can go behind the falls into a narrow cave or hike to the top and jump into the pool below. The legendary road to Hana is 68 miles long, has 620 curves and 59 bridges 46 of which are only one lane wide. The waterfalls along the way are spectacular and are well worth stopping for. About this painting; This is an 11x14 acrylic painting on canvas. I go into great detail of the painting process for this scene in the book. If you want to learn how to paint it or just want to see the process and learn some tips you can buy a signed copy through me or at many art supply stores through out the US, Canada and the UK. Or you can get it online at Walter Foster www.walterfoster.com Amazon - www.amazon.com Barnes and Noble - www.barnesandnoble.com IndieBound - www.indiebound.org Indigo - www.chapters.indigo.ca . Thank you for taking the time to view my work and my blog. Recently I had the pleasure of judging an art show for Petaluma Art Center from the comfort of my studio here in Maui. The process was done through Smarter Entry, a website that manages the jurying process. 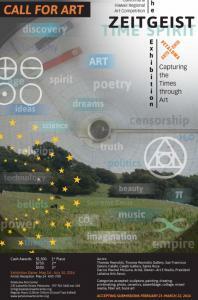 Artist submitted their work to the Petaluma Art Center through Smarter Entry's website. Once the deadline was met, the judges ( 3 of us ) were contacted to begin the process. The first phase was the elimination process. 400 images were entered into the show and each judge could only keep 40. We had three opportunities to accept or eliminate images. The first pass through allowed me to get comfortable with their system. I didn't eliminate very many images, maybe 30, the first round. The ones I did eliminate were the badly photographed, out of focus, hard to see images. The next round was a bit harder. I knew I needed to get the count down to 40. With 370 images left to view, it proved to be pretty challenging. I managed to get it down to about 150. The third and last round was the hardest. Knowing I could only accept 40 images total, cutting out 110 all great art was tough. I went back and fourth over each remaining image, some of them where paintings, some were sculptures, some textile art and some wood carvings. After hours of deliberation, I managed to reach my 40 images. I then had to wait for the other two judges to complete this process before moving onto the next phase. Remember I said each judge could only accept 40 images each. So some of the images I rejected made it through. 67 images made the cut. Phase two was the rating process. Each image had to get a number rating of 1, 3, 5, 7 or 9. The Highest number was the juror's choice for best of show. This was another tough challenge for me. I stated out rating the images that I had rejected but the other judges accepted. Once I was comfortable with hoe the system worked in this phase I got to work on the remaining 50+ images. It took about 4 hours to rate all the images. Once I finished I went back through each one to see if I changed my mind on my first rating. That took another hour. Once I was satisfied with my choices I hit the "Done Rating Button". The show will start May 14th and runs through July 10th. If you are in or around the Petaluma California area, stop in to see the show and let me know what you think. I won't be traveling to the area myself and will miss it. I'm really excited to hear who won! I love the drama of the ocean. Waves crashing on the beaches or rocks is so mesmerizing to me. Capturing the ebb and flow of the water on canvas is a fun challenge for me. Sometimes I can get lost in watching the ocean waves and sometimes I can get lost in painting them, as I did with this painting. I really enjoyed recreating this moment in time. The ocean is always moving. Part of the challenge for me is to give the viewer the illusion of moving water. For this painting I decided to focus on a small area instead of the whole scene. This way I could concentrate my efforts on the water as it hit the rocks and eases back out. Notice the water flowing down the rocks in the upper left side. This gives the viewer the illusion that there was a much larger wave that hit the rocks just moments before. 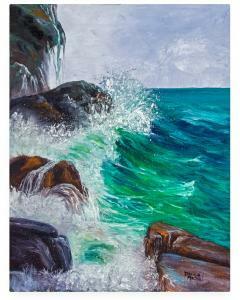 This week's featured 11x14 oil painting, "Waves On Maui" is available as well as prints in many sizes and a few products, such as tote bags, throw pillows and note cards. One of these will surely work well for your decorating needs. Thank you for taking the time to view my work. 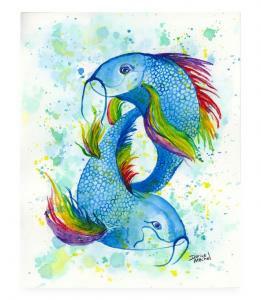 "Rainbow Koi" is a fun, playful and colorful painting and it's my featured painting of the week. These two koi have a Yin and Yang feel to them as they playfully swim around each other. The bright colors will add happiness to any room of your house. This painting is done on watercolor paper with acrylic paints. I started with the background by wetting the paper with water then spattering it with very thin down paint. Once the staged dried I began painting in the Koi. This is one of my favorite techniques to do. It allows me to bring out the playful child in me. 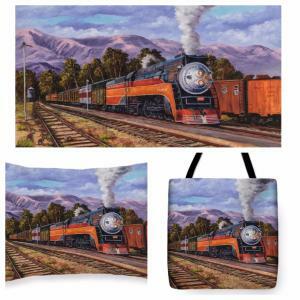 The original painting is available as well as prints in many sizes and a few products, such as tote bags, throw pillows and note cards. One of these will surely work well for your decorating needs. Thank you for taking the time to view my work. For this week's featured painting I decided to post "Southern Pacific Daylight" because this week, tomorrow April 12th, is my dad's birthday. He worked for the Southern Pacific Rail Road many years ago. Read the story below about the creation of this painting. 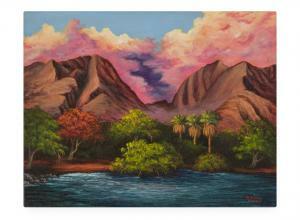 "I embarked on a journey through the California West Coast to create this beautiful oil painting. I did not actually ride this train, just did a lot of research for my painting. The Southern Pacific Daylight was a passenger train that ran between Los Angeles and San Francisco, California. The Daylight, also known as Daylight Limited, operated from 1937 until 1974 and was one of the few passenger trains retained by Amtrak in 1971. Amtrak merged it with the Coast Starlight in 1974. I created this painting for a special customer of mine who is a huge fan of trains. He has a large collection of model trains and is building a special room for them in his new house here in Maui. Since this is a West Coast California train and I'm a California girl (born and raised), I decided to add a family of jackrabbits. (See lower left side of painting). I also used a reference photo from a good friend of mine for the engineer or conductor, who is waving from the train. Her father had past away a few years ago and it was my way of helping her preserve his memory." The original painting is not available. This image is available as prints in many sizes and a few products, such as tote bags, throw pillows and note cards. One of these will surely work well for you or your train loving friend. 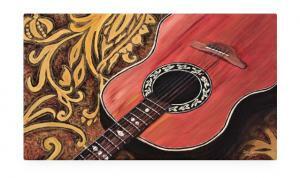 This weeks featured painting is "Guitar Hawaiian Style". I did this painting in honor of my partner in life, Charlie. Who often plays his guitar at night as a way to relax. I enjoy listening to him as I unwind from the day. This painting with acrylics. The background idea came from a piece of fabric we had. Since the music Charlie plays is slack key, Hawaiian style music, I felt it was fitting. The original painting "Guitar Hawaiian style", is available for $550. It's 12 x 22 on stretched canvas. No need for a frame on this one, I painted the sides for that modern look. If a print is more to your liking I have a variety to choose from including metal. This painting is also available on throw pillows, tote bags and greeting cards. This painting is perfect for you music room. It will add a touch of warm tropical music to inspire you. Thank you for taking the time to view my work. I'm so excited to have been interviewed by Zsolt on The Crazy Mind blog. Please take a moment to click on the link button.